An American expat from Las Vegas living in England. Trying to learn about the customs, habits and cultural differences of the English. 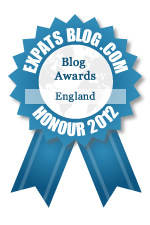 ExpatsBlog.com Expat Blog Awards 2012: England Honourable Mention Award! This blog won the Honourable Mention Award for best expat blog in England! Love the blog!!! Makes me wanna move! She totally captures what it is to be an American overseas! Great blog! Erin has a way of capturing your attention while vividly keeping you entertained through her creative writing style. The true events and experiences it is based on leaves you intrigued no matter what your nationality is. Love this blog! I love Erin's blog. She is enjoying her life's journey and it is fun to read along. Her writings take me to places I may never see. She shares her experiences so her readers can enjoy them too. Erin's blog beautifully captures the expat experience. She expresses the challenges and charm of following your hear, wherever that may be! Great blog. Always check in on a regular basis - gives me a taste of home plus I enjoy Erin's writing style. Love following her unique expat journey. Good job! It's interesting to see England through a different pair of eyes! I love the personal touch Erin gives with every post. Overall, a fun to read and exciting Blog! !